This is a long one, but Canagarajah is so worth it. Canagarajah begins A Geopolitics of Academic Writing with, appropriately, a section called “The Problem.” Specifically, he discusses the imperialism in legitimating the construction of knowledge; that is, how we (as Americans and as members of the center) only accept things as true and fact once the West knows about it and recognizes it as fact (2). Frequently, this validation is dependent on whether that fact is found in print. Canagarajah writes, “When something appears in print it is widely construed as constituting publicly acknowledged facts in a manner that oral communication cannot” (4). This is an interesting follow-up to Brandt’s focus on a contract or documentary society that privileges documents and measures literacy by who controls/accesses those documents. Here, Canagarajah points out the geo-political inequalities caused by this knowledge construction. The exigence for this project is laid out in “The Project” and is the result of ethnic conflict between the Tamil and Sinhalese communities in Sri Lanka in 1983, which caused very serious economic consequences that then impacted scholars’ abilities to access current research, publish scholarship, and interact with international scholarly communities (9). Canagarajah’s work is focused specifically on his and his colleagues’ experiences trying to publish scholarly work in dominant (center) journals from an underdeveloped (peripheral) area (11). His analysis focuses on their drafting and revising stages, compares composing practices across drafts, conducts text-based interviews, collects correspondence with editors and reviewers, records scholarly interactions at UJ, and conducts an ethnography of literate practices within the university community (13-14). Canagarajah focuses a lot on his methods here and of trying to tease out some of the tensions of what it means to be someone who exists within both center and periphery communities. An integral part of his larger project, we can think of the center as the dominant, Western communities that control the construction and legitimation of knowledge; periphery communities, however, are described as Third World, underdeveloped, and/or otherwise marginalized communities that struggle to gain access to the center. As someone who moved between Sri Lanka and New York, Canagarajah acknowledges the paradoxes within this situation: his “double vision” that informs this book (11) and that allows him to profit academically from the deprivation and struggles of his periphery colleagues, the “necessary evil” of a periphery scholar publishing in the center, and whether or not he can now (as a center scholar) represent his colleagues at the University of Jaffna. This last part, in particular, came across in a piece of feedback Canagarajah shares from his mentor (Mr. Canagaratne or A.J.) who critiques his article for its internalization of colonialism, which Canagarajah humbly points out is a danger of discussing the hegemony of center publishing and academic networks through those very channels (27). This project, then, is very much tied to the ethical representation of (our own) communities, driven by “not only the burning desire to articulate the inequalities experienced by my colleagues but the drive to encourage more democratic literacy practices and intercommunity participation in knowledge construction” (18). I find this methodological self-awareness compelling because Canagarajah very directly addresses questions about authenticity and representation that often circulate in discussions of community. Even as a member of the UJ community, he claims no ability to “speak authentically for the periphery” (28) and though he shares some of their struggles, this is not his aim. Instead, his aim is to employ resistance as a theory for “how the disempowered may reconstruct discourses and structures for fairer representation” (30), modeling for periphery scholars how to negotiate dominant academic conventions to their advantage (31). The goal here is not one of appropriation but of establishing “mutually enriching scholarly discourses and more ethical knowledge-construction practices” (31). Canagarajah begins Chapter 1, “Contextualizing Academic Writing” with a reminder of the legitimation of scholarship within the disciplinary community through its appearance in print (which is interesting to consider when we think of critiques of digital scholarship) and a reminder that, though the avenues for publication are increasing, they are not democratizing (33). He also returns to the idea of internalized colonization here, stating, “The hegemony of Western academic journals is so complete that the superiority ascribed to them has been somewhat internalized by periphery scholars themselves” (37). Even in what we term “international” journals, there is an inequality of what (and whose) knowledge gets included. In this chapter—and in the book more largely—Canagarajah seeks to explore “how the advantages of Western scholars and their journals are attributable to material, political, and cultural sources of power” and how the knowledge constructed through research articles (RAs) contributes to material and ideological hegemony (37). Like Brandt’s discussion, this has a number of economic factors. In our capital-based global social system, the center gains advantages of the periphery based on (access to) better economic and technological resources (38). These advantages and ideologies are spread through the Western channels of mass media, information, popular culture, and education (39). They are also spread pedagogically into local classrooms because—as an intellectual center—the West trains periphery scholars, produces scholarship, and offers teaching materials and resources to these marginalized communities (40). Throughout this discussion of the spread of information, of course, there is critical attention to the fact that all of these resources are produced and disseminated in English. Canagarajah makes an important qualification that center and periphery are fluid terms. That is, “there are peripheries within the center (e.g., rural communities and marginalized ethnic groups in the United States) and centers within the periphery (e.g. culturally elite and economically powerful circles in Asia, Africa, and Latin America” (41). Canagarajah makes so many compelling points in this book, and I think when we think of this as an issue of West vs. Third World (or something similar), it’s easier to dismiss his points. By acknowledging that this is an issue within our own communities, too, we can perhaps more readily see the importance of Canagarajah’s work. 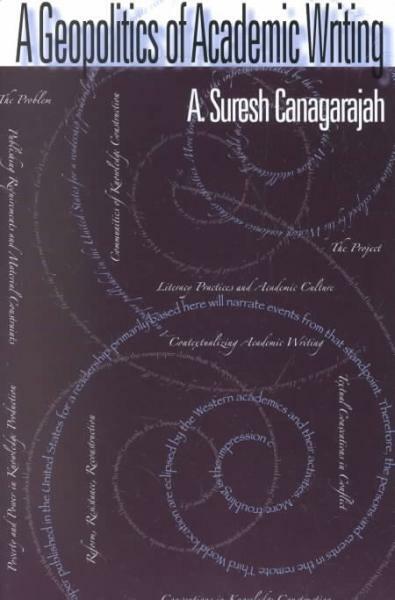 Importantly, Canagarajah establishes his analysis of geo-political inequalities of academic publishing within concrete academic settings and instead of removing them from these settings, analyzes the writing practices of scholars within their own contexts and languages. Canagarajah begins Chapter 2, “Communities of Knowledge Construction,” with a postmodern definition of knowledge as constructed, collaborative, contextual, value-ridden, and discursive (54-55). Ultimately, knowledge is “interested and, therefore, ideological” (57), which we see as different communities struggle not only to construct and legitimate knowledge but also to have it accepted by others. What this also shows is that scholarship that is objective, rational, and empirical is not the only true or valid form of knowledge and that texts are not neutral mediators of this knowledge; rather, they “mediate, shape, construct, and represent knowledge” (59). Here, Canagarajah focuses on the difference between knowledge construction in discourse communities and speech communities. Speech communities are groups based on a shared language and speech interaction and, importantly, through “shared attitudes toward the language” (61). Discourse communities, on the other hand, “hold shared ways of understanding social and material life, in addition to shared uses of language” (61). Often, people are born into particular speech communities, but we have to negotiate our presence into discourse communities and—though we may be part of multiple such communities—membership is “unequally stratified according to access to the required codes” (62). So although discourse communities are dynamic and accommodating, they are also exclusive and “based on conflict,” brought together “based on their shared antagonism deriving from the common desire to dominate material and intellectual resources” (67). This is an important final point because it speaks to the geopolitical inequalities related to knowledge production within different communities. Chapter 3, “Conventions in Knowledge Construction” focuses on the academic conventions that reproduce these inequalities. Conventions are particular to each community’s cultural and intellectual practices and traditions and therefore both regulate and define the community’s identity (83). That is, “[c]onventions constitute discourse” (83). So like discourse, conventions are neither neutral nor passive; they are loaded with social values and immersed in power relations. Canagarajah writes, “New members will be discriminated against for their unconfidence or ‘accented’ ways of using these conventions,” (84) which will mark them as outsiders within the community. We can very easily see this when we reflect on conventions of grammar and the way ESL and international students are marked as outsiders within writing classrooms that enforce these gatekeeping conventions. Relating back to RAs, conventions are shaped by a number of factors: “the state of professionalization, the status of the discipline, and the identity of scholars in the field. Others are extra-academic: the availability of material resources, dominant cultural values in the community, and patterns of social relations in the larger society” (93). And ultimately, Canagarajah argues that academic publishing conventions are the primary reason why periphery scholars are rejected from publication. Chapter 4, “Textual Conventions in Conflict,” offers specific examples of the convention constraints that chapter 3 theorizes. For example, Canagarajah argues that although local (periphery) writers frequently know that they need to write within RA conventions of IMRD (Introduction, Methods, Results, Discussion), they often don’t have the resources available to write in this way. Instead of rhetorical reading, which situates texts within wide social contexts, many periphery scholars take an autonomous-text approach to reading that “focuses on drawing out the main concepts and information within a narrower frame of textual context” (126) because they don’t have access to the other texts that allow them to do the contextualization work of rhetorical reading. Interestingly, Canagarajah argues here that we shouldn’t judge the quality of scholarship based on the date of citations that appear within it (127), which tends not to be what we think. I think this is important, though, because we often dismiss important work simply because it’s dated. Canagarajah also points out because of a lack of material and technological resources for research, it is difficult for periphery scholars to follow the detailed methods that many RAs include and they frequently rely on alternative research methods that are low-cost and more focused on reflection and embodied knowledge. Extending from his discussion in “The Problems,” Canagarajah notes in Chapter 5, “Publishing Requirements and Material Constraints,” that though certain publishers have begun to think about more democratic practices, the conventions he detailed before have not yet been considered (158). A major critique in this chapter are the ideological implications of bibliographies and documentation; that is, Canagarajah points out that the “close fit between a disciplinary community’s beliefs and its para-textual conventions presents alarming implications for knowledge construction” (159), particularly when center scholars have access to those texts more easily than periphery scholars. We also see exclusion in such “small” details as printing, having access to good paper, and revising and editing within deadlines. The separation of local scholars from center publishing practices allows them to develop their own conventions, but this contributes to the cycle of isolation and makes it more difficult to learn the dominant conventions. In Chapter 6, “Literacy Practices and Academic Culture,” Canagarajah focuses specifically on the academic culture at UJ in Sri Lanka as an example of the hegemony of knowledge production. He describes the culture there as hybrid, split on what the legitimate mode of knowledge construction and communication should be, but open to different knowledges—including indigenous/religious and oral traditions (186). He argues that the academic culture is very egalitarian and civic-minded and that the scholars are interested in and expected to give back to the community (188). This can be seen in the focus on teaching and service rather than research and the attempts to publish in non-scholarly avenues and make research accessible to general audiences (190)—which is something I think about often, particularly when we do research that affects particular communities. Some of these “non-scholarly” writing channels involve creative, textbook, and bureaucratic writing, but many of these channels are also oral. In fact, Canagarajah argues that in this context oral knowledge construction is more important than both reading and writing and occurs frequently in religious, cultural, and social gatherings within the community (216). He describes the importance of participating in meetings and colloquia as “primary criterion for one’s scholarly ethos and authority” (219) and points out that these moments are enjoyable and meant for the sake of talking simply to engage with colleagues, not to generate ideas or to work on projects. In Chapter 7, “Poverty and Power in knowledge Production,” Canagarajah returns to the important role that economic power plays in knowledge production, focusing not only on the economic poverty of periphery communities but also the intellectual poverty that results from these systems. Also revisiting the point made in chapter 1, Canagarajah points out that not only do Western institutions donate teaching and scholarship resources but these resources are often outdated, which necessarily impacts knowledge construction. Finally, Canagarajah emphasizes the idea that both center and center academic communities must participate in the creation and development of a more inclusive atmosphere for knowledge construction. On periphery scholars’ end, he recommends more critical reading and writing, developing a rhetorical self-consciousness, and establishing new networks of research—that Third World governments need to support (289). On the other end, he recommends reworking citation standards, editorial boards, and formal language requirements for RA submissions in academic journals (274). He also recommends clearer and more transparent communication between editorial boards and peripheral scholars, which seems like a good practice for all journals for all people submitting, particularly since the publishing (and specifically the reviewing) process often seems mysterious. And important for this particular moment (and perhaps more possible with the increasing number of online journals), Canagarajah also recommends more sharing of intellectual property between center and periphery so knowledge is more mutually constructed and legitimated. Canagarajah, Suresh A. A Geopolitics of Academic Writing. Pittsburgh: U of Pittsburgh P, 2002. Print.